Modernize your legacy Zend Framework applications. Zend Framework 1 was one of the first major frameworks for PHP 5 and, for many, introduced object-oriented programming principles for writing PHP applications. Many developers looking to embrace a well-architected and supported framework chose to use it as the foundation for their applications. However, the first version was not without its faults. Zend Framework 2 is a significant improvement over its predecessor. It re-designed key components, promotes the re-use of code through modules, and takes advantage of features introduced in PHP 5.3 such as namespaces. The first release of ZF1 was in 2006. If you’re maintaining an application built on it, this practical guide will help you to plan how to migrate to ZF2. This book addresses common issues that you’ll encounter and provides advice on how best to update your application to take advantage of ZF2’s features. It also compares how key components have been updated and how to address these changes in your application code. 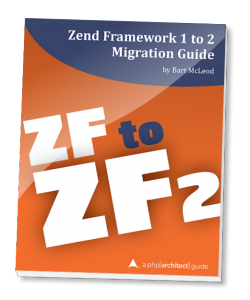 Written by PHP professional and Zend Framework contributor, coach, and consultant Bart McLeod, this book leverages his expertise to ease your application’s transition to Zend Framework 2.